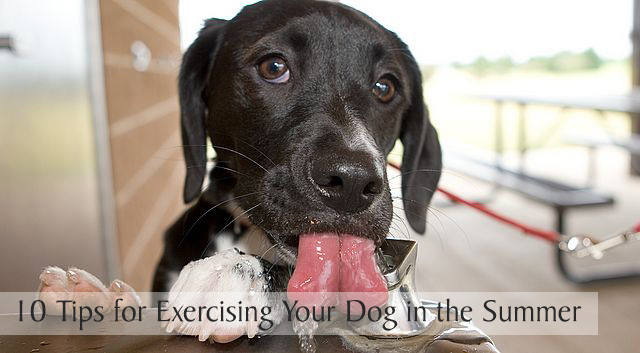 Exercising your dog is important all year long. Last fall I wrote 12 Easy Ways to Exercise Your Dog in the Winter, so with the temperatures starting to warm up and summer being right around the corner, I wanted to share some safety tips for exercising your dog in the summer. High heat and humidity levels can pose a risk to your dog’s health, so whether you’re hanging out around the house this summer or preparing for a vacation at the beach, keep these tips in mind to keep your dog cool and comfortable. 1. Don’t leave your dog in a parked car. If you drive somewhere to exercise your dog, please don’t risk your dog’s life by leaving her in a parked car when it’s warm outside. Every summer we read heartbreaking stories about dogs that die from heatstroke because they were left alone inside of vehicles. I can’t imagine there are still people out there that haven’t heard about the risk of doing this or maybe they ignore the warnings thinking that they’ll only be gone for a few minutes and their windows are cracked open. On a warm day, it only takes a few minutes for the temperature inside a closed vehicle to reach a dangerous level for a pet and it’s worth noting that it’s illegal to do this in many states. 2. Keep a close eye on your dog. The best way to protect your dog when the weather gets hot is to be observant of her behavior. If you notice signs like excessive panting or your dog seems hot, tired or draggy, she may be starting to get uncomfortable from the heat. By watching her behavior carefully, you can prevent dehydration or heatstroke before it happens. Energetic, fun-loving dogs can become overheated and dehydrated while playing, so give them frequent breaks from the action and lots of water to drink. 3. Keep high-risk dogs indoors. Certain dogs are at increased risk for heat related illnesses and should mostly be kept indoors when it’s hot and humid. 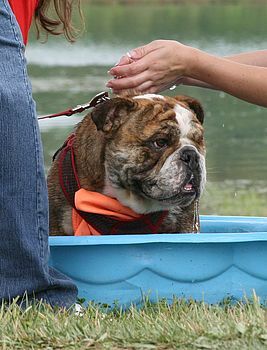 High temperatures can be extremely hard on older dogs, very young dogs, overweight dogs and dogs with short muzzles (bulldogs, pugs, Boston terriers, etc.) Dogs with heart or respiratory diseases should also be kept inside where it’s cooler. Most dogs appreciate being indoors if the weather is extremely hot, especially dogs with thick double coats. 4. Know the symptoms of dehydration and heatstroke. In hot weather, dogs can easily become dehydrated if they don’t drink plenty of cool, fresh water. Signs of dehydration include lack of skin elasticity, sunken eyes, dry or sticky gums, lethargy, changes in urination and slow capillary refill time after pressing on their gums. One way to check for dehydration is to pull up your dog’s skin on the scruff of their neck and watch how quickly the skin returns to its normal position when you let go. If the skin doesn’t return to its normal position almost immediately or after just a second or two, your dog could be dehydrated. Prevent dehydration by making sure your dog always has plenty of fresh water available to drink. Heatstroke occurs when a dog’s temperature rises to a level where they can no longer cool themselves normally. Symptoms include heavy panting, drooling (early on), an anxious expression, staring or glazed eyes, failure to respond to commands, fever, rapid heartbeat, lethargy, bloodshot eyes, excessive thirst, difficulty breathing, lack of coordination, vomiting, deep red or purple tongue or gums, seizures and unconsciousness. Dehydration and heatstroke are serious medical conditions that need immediate attention and treatment. See the section below to learn what you should do if you think your dog may have heatstroke. 5. Limit exercise duration and intensity. As temperatures and humidity levels climb, plan to adjust your dog’s exercise routine accordingly. Overweight dogs and dogs with darker colored coats tend to get overheated quicker when exercising in the sun and heat, so walk or exercise in the early morning or late evening when it’s cooler or take shorter walks in areas that are heavily shaded. Although I’ve never tried one on Haley, some dogs may enjoy wearing a cooling vest while exercising. If you’re visiting an area that’s much warmer than what your dog is accustomed to, allow her to adjust gradually to the warmer climate. 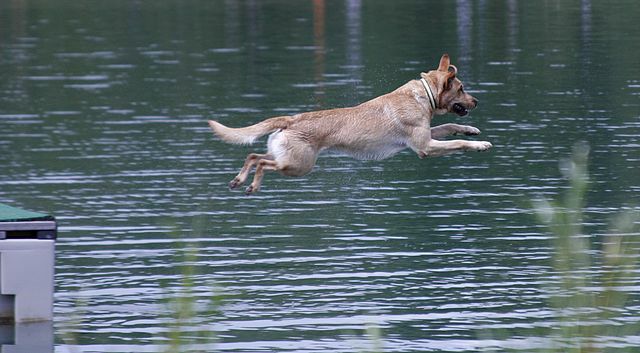 Water-related activities are perfect for keeping dogs cool on sweltering summer days. 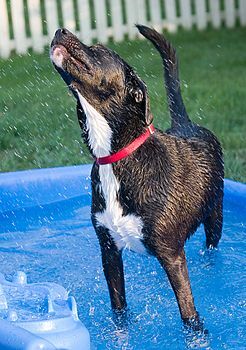 Head for the swimming pool or lake, fill a kiddie pool with water in the backyard or turn on a sprinkler for your dog to run through. If you discover your dog digging in the yard and resting on exposed dirt, consider building a digging station or buy a cooling pad for her to relax on. 6. Always provide cool, fresh water. Your dog should always have access to water. Don’t just check to make sure her bowl is filled, but change the water often to ensure it’s fresh and cool. If you’re hiking or exercising your dog away from home, carry a water bottle with you and stop often to allow her to drink. If your dog doesn’t like drinking directly from the bottle, take along a small collapsible bowl or a hinged bowl that’s made to screw on to the end of a water bottle. In a pinch, you can even cup your hand under the water bottle to form a bowl that your dog can drink from. 7. Maintain a cool environment for your dog. While in the yard, make sure your dog has a well-ventilated shady area to rest and cool off and keep the temperature comfortable for your dog inside the house when you’re away from home. Fans come in handy when a little extra air circulation is needed. Never keep a dog outside when it’s extremely hot and humid. If the conditions are unbearable for you to sit outside, it’s probably not safe or pleasant for your dog either. 8. Protect those paw pads. Hot pavement or beach sand can cause severe burns to a dog’s paw pads. Sometimes us shoe-wearing humans forget just how hot some walking surfaces get in the summertime. To keep those paw pads healthy, walk your dog in grassy areas, have her wear summer booties or apply a protective wax like Musher’s Secret to her paw pads before heading out for your walk. 9. Protect your dog’s skin. Short-coated and white colored dogs have less protection from the sun’s harmful rays. Protect your dog from skin cancer by using a pet safe sunscreen, particularly on their nose, ears and any areas of pink skin. The ongoing debate about shaving dogs with long hair or heavy coats continues, but most people agree, it’s much safer to do daily grooming and a light trimming of the coat rather than shaving a dog which can leave their skin unprotected from the sun. 10. Avoid using a muzzle. Dogs have very few sweat glands, most of which are found on their paw pads. Their primary method of cooling off is through panting. Any restrictive muzzle or head gear that prevents a dog from panting normally in order to cool down can be dangerous to use in hot weather. A good alternative would be a greyhound-type muzzle if it’s appropriate for your dog. I hope you never have to treat a dog for heatstroke, but it’s good to know what to do in case you’re ever facing this emergency. Heatstroke (hyperthermia) is a serious condition that requires immediate treatment. If a dog is suffering from heatstroke, you must work quickly to lower the body temperature of the dog and transport it to a veterinary clinic as soon as possible. Move the dog to a shady or cooler location if possible and apply cool water to the dog’s body by using a hose or a towel soaked in cool water. Focus first on the neck, belly, head and paw pads and refresh the towel with the cool water every few minutes. Offer some cool water to drink and take the dog’s temperature, if possible. A dog’s normal body temperature can be between 100.5 to 102.5 degrees (Fahrenheit). 103 degrees and above is considered a fever with possible permanent tissue and organ damage occurring around 106 degrees. The goal for treating a dog with heatstroke is to reduce the dog’s temperature to 103 degrees in the first 10-15 minutes, then stop the cooling process to allow the dog’s temperature to regulate back to a normal level which will prevent over cooling and having the temperature dip too low. Even if your dog seems to have recovered from an episode of heatstroke, it’s still important to have her evaluated by a vet to make sure there are no complications from the event. Let’s keep our pups safe this summer and if you’re planning a beach vacation, check out 15 Tips for Taking Your Dog to the Beach! 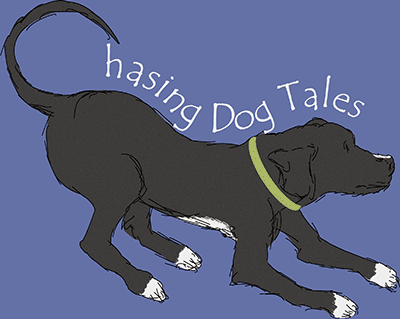 Share your ideas, favorite products or tips on exercising your dog in the summer. Oh these are great tips!! You hit them all for me. Our first walk is usually at 6:00 am and if I can’t get to the woods in the afternoon (where it’s typically cooler) I will wait to walk at least until dusk. Without the sun beating down on us, it’s far more pleasant. Last year we lucked out and had very few days where it was too hot for mid-day walks, BUT I do need to remember the Musher’s Secret. Great post. Thank you, Jodi! You’re better at getting up in the morning than I am, lol! I always have good intentions to go for those early morning walks but it usually ends up being in the evening or after dark. Great tips! We always carry water for Rita (not for ourselves usually but always for the dog!). When it’s REALLY hot we try to get up early and go down to the beach so she can cool her feet off in the water. She’s not a big fan of super hot weather! Wonderful post covering all the do’s & don’t’s of doggie summer exercise 🙂 I also can’t believe that some people STILL leave their dogs in cars on warm days. Crazy. I know, I absolutely hate reading those stories every summer! So sad. Nice post, Elaine. My golden retriever Savanna gets extremely excited about going on walks or for a ride in the car, so she needs water to drink after only about 5-10 minutes of walking. I have one of those travel pet water bottles with the side that flips down to become a water dish and it works well both for car rides and for walks. Thanks for sharing the link, Rachele. This is one of the nicer flip bowls I’ve seen, most of them have bowls that are kind of small for bigger dogs like Haley and Savanna. It was so hot last summer, we were unmotivated to go on walks and Chewy got a little fat…whoops! But he’s all good now. I think we’ll just do more swimming this summer. 10 great tips, thanks for sharing! Thank you, JoAnn! Summer will be here before you know it. Was very glad to see the heatstroke reminders at the end of your list. We’ll be watching Honey carefully when we head to the Caribbean. I suspect we’ll be doing most of our exercise early in the morning and as the sun goes down. And I’m always amazed more people don’t carry water for their dogs. We went to a street fair recently and I didn’t see anyone carrying water for their dog except us. Mr. N is going to get shaved down at his next appointment plus he has a cooling coat. Really covered everything! Water is #1 for us. Such good tips for Pug Parents like me. I may get some of that Paw protector (Kman hates shoes/books), plus love the look of a little shallow splash pool. Kilo tends to dislike getting wet but in the heat, maybe he would jump in with me. Haley’s the same way, she doesn’t care for boots. Musher’s Secret works great for hot pavement in the summer and it prevents ice balls from forming between their toes in the winter. There are some other brands of waxes available, but we’ve used this for years and love it. Have a great weekend too! Great and important post. We are not fans of summer at our house. Luckily, we always to our long walk and/or runs early morning, so it is the cooler time of the day. People have to remember dogs are living beings and not machines. Common sense can go a long way. Thanks for joining the hop. I’m going to try to be more of a morning walker this summer too, rather than waiting until evening like I usually do. You’re exactly right about the common sense! Great tips – always good to remind folks of summer dangers – especially #1! Yes, wouldn’t it be great to not hear any heartbreaking stories of dogs or kids being left in cars this summer? All great tips! Once it gets hot in the south, we don’t go out much in the middle of the day. We do love finding places to swim, though! Thanks, Diane! I’m hoping we can find some new places to swim with Haley this summer too. I wish we had a dog beach or dog pool closer to where we live. Now that the tropical storm has headed north to North Carolina they are calling for temperatures here in the 90’s. The alligators are making their presence known so swimming is no longer an option for keeping cool. My Human depends on early morning or late evening for play and exercise time…more in the morning since evening can be stifling. And don’t forget the pedialyte to keep us pawed ones hydrated. Thanks for sharing the Pedialyte tip, Hawk! Ninety degrees with a chance of alligators would make me stay out of the water too! This is such an awesome post! I’m going to share it on my page. Luckily we live in a pretty mild climate now, so it only gets hot about one month out of the year but when I lived in California and Nevada I saw some pretty ridiculous things! People really are not aware of their dogs overheating and it’s so sad. Thanks for sharing the post, Lauren! I think I’m ready for a move to a milder climate. I love the change of seasons, but it’s sometimes difficult to get out and exercise with Haley when the winters are so cold and the summer heat gets oppressive. Thank you, I appreciate the compliment! 🙂 I’m sure you guys probably have some great tips for city dogs and hot, summertime weather! Thanks for your tips. These are the must needed and basic tips for every dog owner. There can not be better tips for dog exercise in the summer. Of course, regular exercise is must needed for the dog, especially the hunting dog like Brittany Spaniel, English Setter or Bracco Italiano. Giving healthy food and regular health checkup is also very important. I think grooming is also a very important matter that we should do properly in the summer. If we can grooming our dog properly can easily skip a lot of dog problems. Thanks again! Thanks for that important reminder about grooming, Josh. Having a short-haired dog has made me a bit spoiled and sometimes I forget how much grooming and maintenance is needed for some breeds. My sister has a young Soft-Coated Wheaten Terrier and grooming is pretty much a daily “must do” task.